Did you know that anyone can host a game jam on itch.io? Well now you do, great! A lot of game jams are collaborative events, hosted by more than just one person. 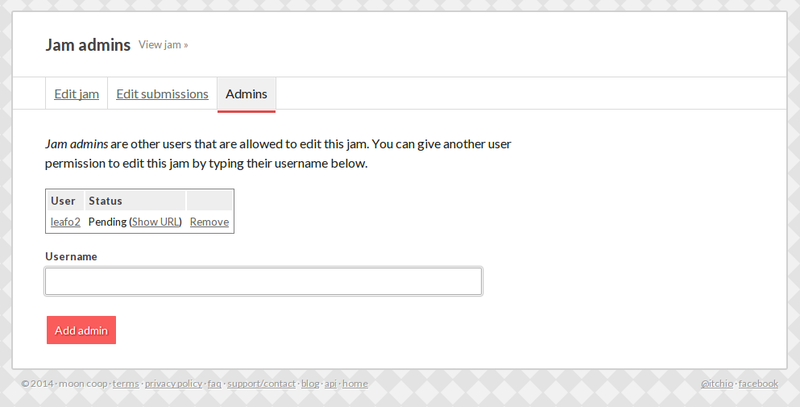 For this reason, starting today, you can add Jam admins to you game jams. You can now let other users on itch.io have edit access to a jam you’ve created. You can find the new Admins page on the game jam edit page in the new tab bar below the title. Adding a jam admin is just like adding a game admin, you need to type in their username and then you’ll be given a link to share with the prospective admin.